Ashley Thompson’s love for the game started young. “Thompsy-Girly,” as she is known by her fellow teammates, did not originally have plans to play intercollegiate softball — let alone for a Division I team like BYU. Thompson, a senior, certainly had an impressive high school career, finishing with a total high school game record of 86 wins and only six losses. In addition, Thompson holds various records in her home state of Washington, including the state career strikeout record with 1,117 and the career home run record of 51. She also led her high school to three straight 1A titles and her club softball team to the ASA Gold National Championship tournament. Since the start of her collegiate career, Thompson has dominated on and off the field. In the 2017 season alone, her final season playing for BYU, Thompson was added to the Fast Pitch News 2017 Preseason Top 50 NCAA Softball Hitters list, recorded the second-most stolen bases in a game by a BYU player against Miami and had a season-high four RBI at Santa Clara. 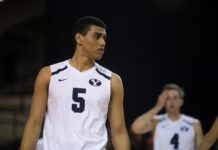 Thompson was the only player to start all 59 games for BYU this season. She hit eight home runs and drove in 41 RBIs while batting .339 and stole 16 bases this season. Her 43 career stolen bases ranks fourth in BYU history. Additionally, Thompson was named to the 2017 West Coast Conference Softball All-Academic Team, which recognizes student-athletes’ pursuits of academic excellence. 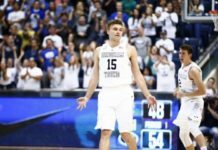 Thompson has thrived as a true blue Cougar. However, growing up without a religious background, Thompson didn’t even know about or consider BYU as an option for college until she transferred to Connell High School. 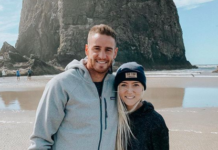 Thompson explained she was attracted to BYU for a few reasons, namely the coaching staff, the beautiful sports facilities and the standards and values the school upholds, which are similar to Thompson’s personal values. With a friendly smile, an infectious laugh and an easygoing attitude both on and off the field, Thompson has had a positive impact on many of those she’s come in contact with during her time at BYU. One of Thompson’s teammates and best friends, McKenzie St. Clair, says everyone on the team loves and respects Thompson. Thompson attributes part of her success to her supportive family — specifically her parents, Ron and Shelley. Based on the most BYU softball games attended, Thompson’s biggest fan may be her dog, Gunner, a Shih Tzu breed. Thompson jokes he is the team’s unofficial mascot because of how much time he spends with her teammates. Thompson said Gunner is one of three things she can’t live without, along with Netflix and her planner. Whether Thompson decides to play professionally in Europe or dive right into graduate studies, one thing is for sure: she can reflect back with pride on her collegiate career and the success she contributed to BYU women’s softball. She can also face the future with confidence — knowing she has a strong legion of fans, friends, coaches, family and yes even canines — to support her along the way.